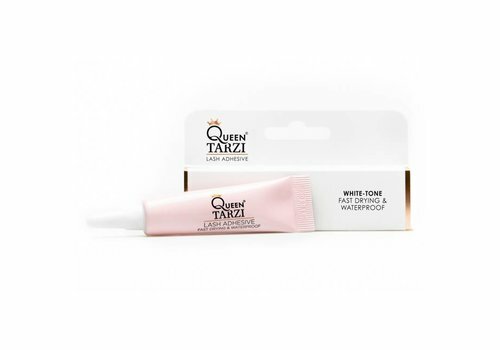 Buy Queen Tarzi Lashes online at Boozyshop, the makeup webshop! With beautiful eyelashes you complete your make up look. The eyelashes of Queen Tarzi not only make your eyes bigger, but also more bright and eye-catching. Through the eyelashes of Queen Tarzi every woman can shine with beautiful silk lashes. According to Queen Tarzi, every woman deserves to have beautiful lashes. There is quite a difference between natural and synthetic lashes. Synthetic lashes feel unnatural because of the thick plastic band. In addition, these lashes often irritate and feel heavy on your eyelid. Queen Tarzi's silk lashes are of very high quality with a flexible cotton strap. This makes the lashes feel extra natural. All eyelashes from Queen Tarzi are free from chemical processing and dyes. These lashes are also vegan and hypoallergenic. A very responsible choice are these eyelashes. All eyelashes are light and have a beautiful shine. You can wear the lashes again with the right care up to 20 times. 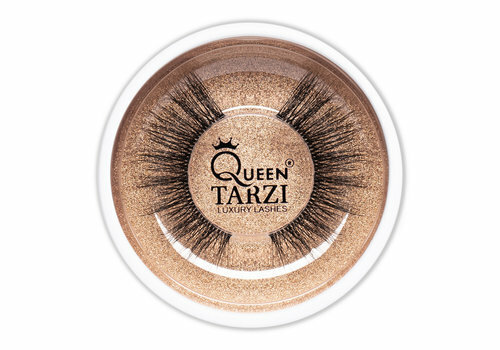 The lashes of Queen Tarzi are made of poly fiber material (PBT) which is used to create the feeling of silk. This makes all products cruelty free! Life is short, lashes do not have to be! Place the strip of the artificial eyelashes in line with your natural lash line. Cut if the eyelash strip is too long. Apply a thin layer of glue to the entire lash line. Remove the adhesive residue from the lashes and place the lashes in the original packaging for reuse. Order your Queen Tarzi eyelashes here today at Boozyshop! The eyelashes of Queen Tarzi come in all shapes and sizes at Boozyshop and you can always count on professional and personal advice. Do you have questions about the use of fake lashes or would you like to know which lashes are best for you? Then contact the live chat and we will provide suitable advice. So you will find exactly the false eyelashes that meets your expectations. Ordering false eyelashes at Boozyshop brings several benefits. Is the order amount above 30 euros? We will send a nice gift with the order. Do not wait any longer and order your fake lashes from Queen Tarzi today at Boozyshop!